"Nuclear Negotiator Award: for keepin’ the fuel bundles cool in a crisis"
Theresa Same (third from the left), recipient of the Nuclear Negotiator Award from CAN. 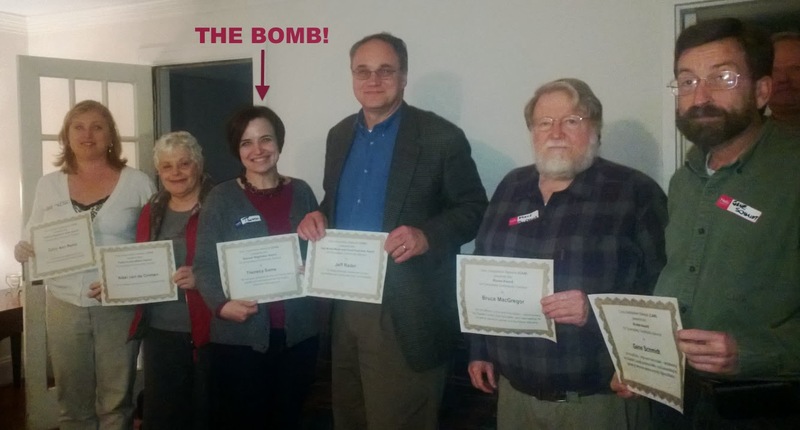 Other awardees were recognized for responsiveness to constituents (Jeff Rader, 4th from the left) and for being active in helping fine-tune developing legislation. See the award nomination for additional information. The award recognizes various categories of volunteers "for service above and beyond the call of duty." That only begins to describe Theresa's tireless contributions to MANA, nearby neighborhoods, and the County at large. Theresa has been instrumental in MANA's leadership, in negotiating with developers, and in helping neighbors address concerns with nearby businesses (and sometimes, even with one another). Nominations were judged by Commissioner Kathie Gannon, Commissioner Stan Watson and Senator Jason Carter. Congratulations, Theresa, and thank you for all you have done and continue to do. Your advocacy for the needs of our residents and your dedication to the overall improvement of our community are truly formidable.